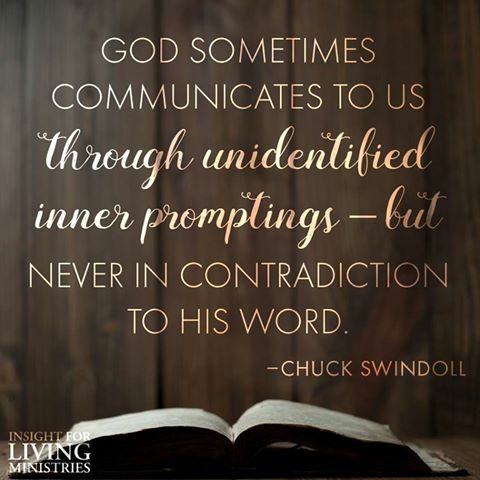 Does God speak in unidentified promptings? A quick lesson on discerning a meme. I saw this on Facebook. Here is a lesson on how to parse the silly sayings we see on social media. Let;s take it apart phrase by phrase and really think about what it is trying to communicate. “Unidentified promptings” contradicts his word on the face of it, because He always identified Himself as the One speaking. Even when God spoke to pagans they knew this was an authoritative and undeniable voice of a God they must obey. In addition, if the promptings are unidentified, how do you know they are from God? We know the devil speaks. (John 8:44). We know our own heart speaks too, for out of it come evil thoughts–murder, adultery, sexual immorality, theft, false testimony, slander; saysMatthew 15:19. Why would you want to risk acting upon something that could either be from the devil or your own dark heart? Third, do you ever act on unidentified promptings in other cases in real life? If an unidentified voice whispered over the intercom at work to go do something, would you? If an unidentified voice left on your phone messages urged you to an action, would you do it? No. You’d probably say ‘This is creepy’ and delete the message or ignore the intercom. Why risk following an unidentified prompting that more than likely is coming from the devil or your own foolish heart? Next, ‘promptings’ cannot be confirmed by the word. A prompting is a nebulous, gossamer thought like the last remnant of a dream you’re trying to hold on to before full consciousness erases it. How can the word of God confirm something so tenuous? In the Bible, is there a Book of Unidentified Promptings to which we turn blank pages and write our own indefinite and unclear words in invisible ink? Last, ‘promptings’ are not a communication. They are an unidentified feeling, more than likely generated by ourselves from ourselves to ourselves. Mr Swindoll’s is a ridiculous statement. Leave the unidentified promptings alone. Better to just read God’s word, make decisions according to His commands and precepts, and take responsibility for them.